Connecticut Transportation Commissioner Joseph J. Giulietti announced that towns and cities across Connecticut will receive $13.4 million in funding under a grant program to construct projects that support pedestrian and bicycle safety, as well as improved accessibility in the state. The “Community Connectivity Grant Program” (CCGP) is an infrastructure improvement program that seeks to provide construction funding for local initiatives that will improve the safety and accessibility for bicyclists and pedestrians in urban, suburban and rural community centers. These community centers serve as places where people can meet for employment, educational, social and recreational activities. The CCGP is one component of the broader Community Connectivity Program. 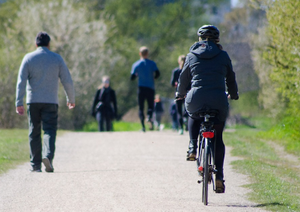 The primary goal of the program is to make conditions safer for people of all ages to walk, bike and take transit, thereby encouraging more people to use these healthy and environmentally sustainable modes of travel. At the same time, these improvements will make Connecticut’s community centers more accessible places to live and work. For more information on the Community Connectivity Program, please visit: http://ctconnectivity.com/.